Prepare baking tray by lining with baking parchment. Cream butter and sugar until soft and pale, add egg yolk, stir in the flour, and mix to a soft dough. Roll pieces of dough approximately 20 g weight into a ball. Roll each ball in the oats. Place on a baking tray and flatten slightly. 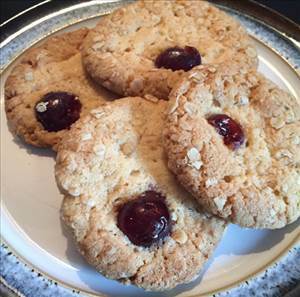 Press half a glace cherry into the middle of each biscuit. Bake in the centre of a pre-heated oven at 170 °C for 18-20 minutes or until golden brown. Wait until completely cold before eating. These biscuits will keep for 4-5 days in a sealed tin. There are 126 calories in 1 serving of Melting Moments.